Recently we had been to a Bengali restaurant here, in Bangalore and we had ordered a Raja Rani Thali ( super big size vegetarian thali that can be easily shared between 4 people ). The thali consisted of six or seven curries served with luchis and plain rice along with the traditional Bengali rasagulla. I just loved all the dishes, each of them had a unique taste, with the aroma of mustard oil and khus khus. 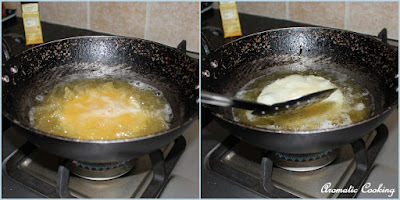 I have made a couple of Bengali dishes at home, but I haven't yet cooked anything in mustard oil. Long time back, when I was just married, I had bought a bottle of mustard oil, but the pungent smell was too much for me at that stage and I ended up wasting it. Now again, after so many years, I have bought a bottle and it's yet to be opened, but this time I will definitely cook something with it. I think, after so many years of cooking and more exposure to other cuisines, I am now ready for it. Well, coming to today's dish, it's another Bengali Kachori, Koraishutir Kochuri, or Green Peas ( Matar ) Kachoris. 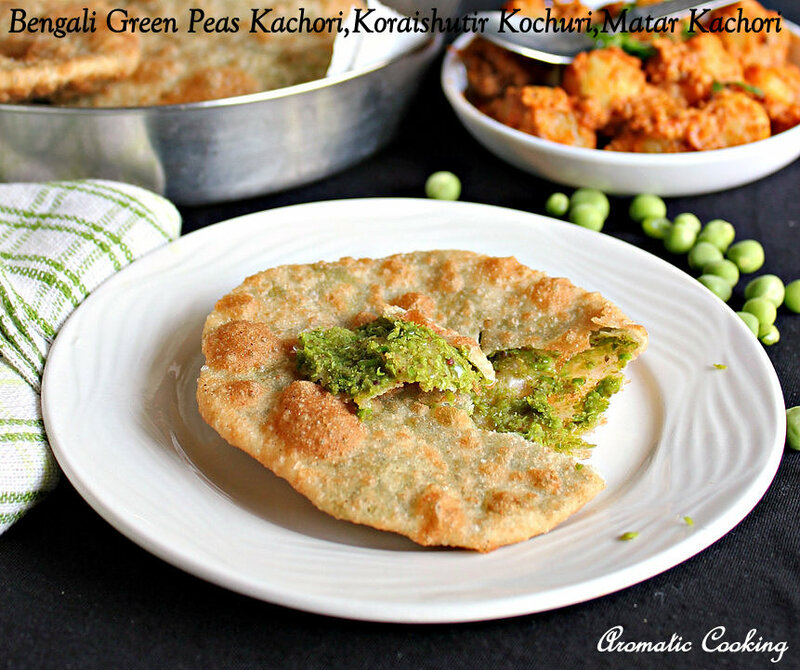 Bengali Kachoris are basically deep fried, stuffed flat breads. 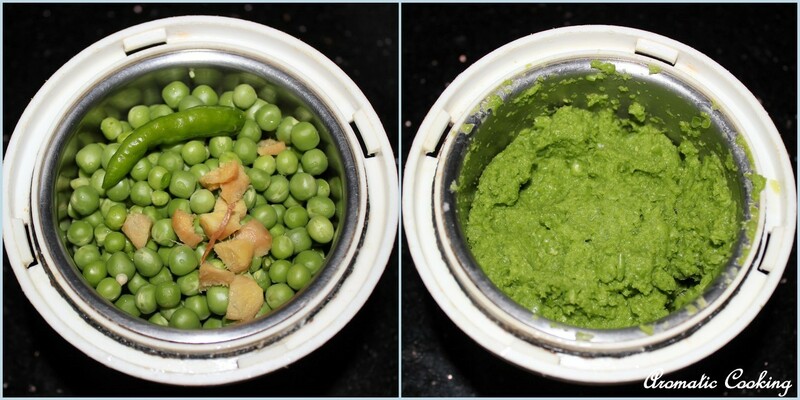 I have already tried and posted Radhaballabhi which has a stuffing with urad dal, now in this one, the filling is with green peas. It's traditionally made during the winter, when fresh green peas are in season, but when we don't have fresh peas, we can still make them with the frozen ones. I had served these kachoris with the Dum Aloo With Coconut Milk, and we simply loved it, do try this out for a weekend breakfast or brunch and I am sure you'll like it.. Mix the flour, oil and salt, then adding some water, make a smooth and stiff dough, apply some oil and leave it covered for an hour. 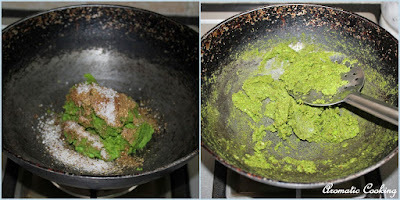 In the meantime, grind together the green peas, green chilly and ginger into a coarse mixture. Heat some oil, add the ground paste, coriander powder, cumin powder, salt and sugar and keep mixing on low heat till it's dry and cooked. Remove and let it cool. 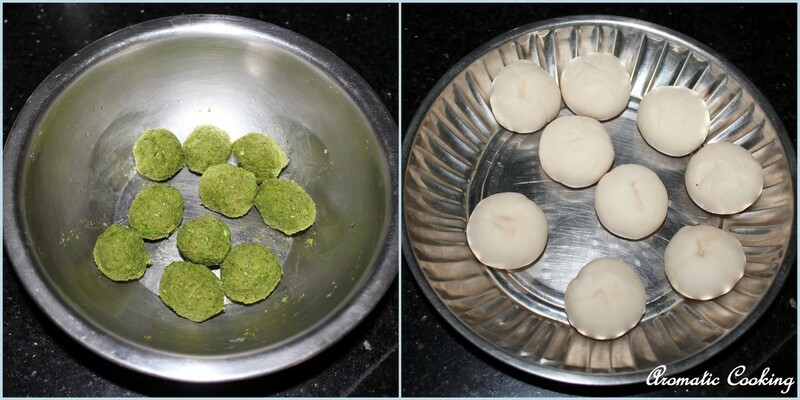 Now divide the dough and the filling into 9 or 10 portions and make balls with them and keep. 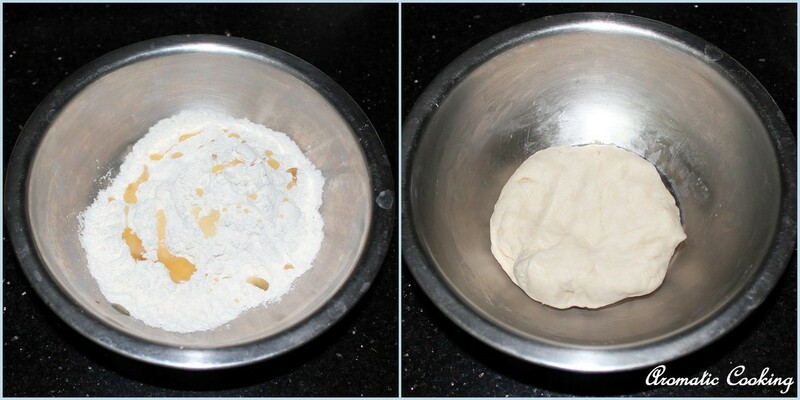 Take one ball of dough, flatten it a bit, place the filling ball, then close the dough as shown in the picture. Then dusting some flour, roll it out carefully into slightly thick discs. Heat some oil for deep frying, then slide in one disc at a time. Wait for it to rise up, then press it gently with the laddle. Once the kachoris puff up, flip it, cook on the other side and remove. Though I was tempted to replace the maida with whole wheat flour, I didn't do it, since at least once. I want to taste the original. Maida kachoris taste different from the ones made with whole wheat flour. While rolling out the kachoris, care should be taken that the filling doesn't come out and there are no holes, otherwise the kachoris will not puff up. 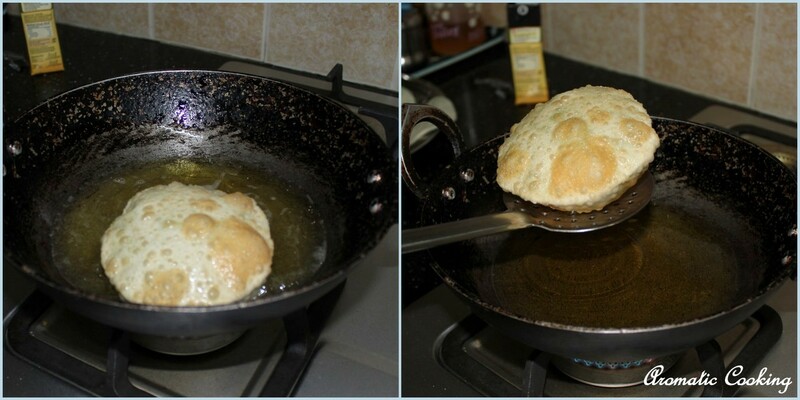 Wow, nice poori stuffed with peas, is really tempting. Bookmarked it to try soon. Wow! 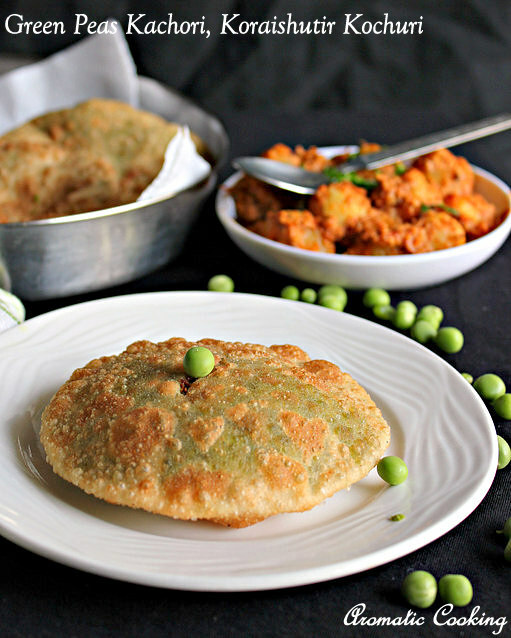 this vibrant stuffing of kachori looks delicious, Hema. I wish I could have 3 or may be 4 kachories right away! Kachori looks delicious Hema I can have them with tea or coffee. Kachori looks super tempting!! Lovely green colour! !